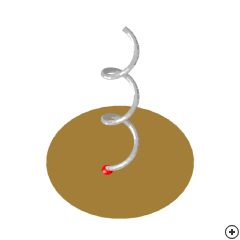 Image of the Normal-mode helix. This linearly polarised antenna is used when a simple, electrically small antenna is required. Its relatively short resonant length and simple construction makes it popular in small transceivers such as handheld personal radios. This antenna geometry has two principle modes of operations, namely broadside (normal-mode) and end-fire (axial-mode). End-fire operation occurs when the antenna is electrically large. Being electrically small, this antenna features narrow impedance bandwidth, in the range of 3%, and a low radiation resistance, in the range of 4 to 15 Ω. However, it has a higher radiation resistance than that of a conventional short (straight wire) monopole of the same height. It also has a low gain of less than 3 dB. Electrically small ground-planes of diameter less than λ0/4 are often used. 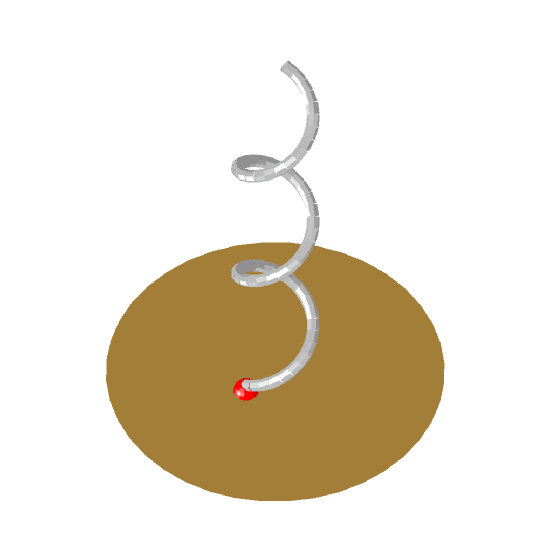 The finite ground-plane reduces the radiation resistance somewhat, but does not have a strong effect on the broadside radiation pattern.